We've had a little bit of game marathon fatigue up here in the Tower, but Desert Bus for Hope, as something of a granddaddy of all of these — not to mention the absolutely absurd and painful game they chose — gets a pass from me. 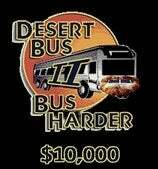 It began yesterday and, already into its 21st hour as of this posting, Desert Bus for Hope 2: Bus Harder has raised more than $10,000, meaning the drivers are already in for at least four days of torture. Last year's drive raised more than $20,000, so hopes are high this will beat the previous mark. The beneficiary is Child's Play, which buys toys and games for kids in the care of 40 children's hospitals nationwide. The way it works, donations buy time that the players must spend driving in Desert Bus — the infamous minigame in Penn & Teller's Smoke and Mirrors for Sega CD, which simulates a bus trip from Tucson, Ariz. to Las Vegas, in real time. This sounds like one of those ideas I wish I'd thought of, then would probably regret once I started playing. But still, if they ever put this game on PSN or XBL, I'd be powerless to resist downloading it, even at $10. The site features a clock and a cam and a running tally of donations, plus a bunch of amusing 'shoops (or LOLBuses, I guess) for every $1,000 they raise.